The number of casualties caused by the radiation that was released in the Fukushima accident is zero and will probably stay zero. We have stated that on this website multiple times and there is no reason whatsoever to change that position. But even when some gloomy expectations come true and radiation indeed kills people it remains highly doubtful whether their numbers will add up against the casualties claimed by the evacuation of 100.000 people. Let’s try to make up the balance. Was there any need for this evacuation? The Japanese authorities decided to mass-evacuate their population when there was reason to think that the people could receive an extra yearly radiation dosis of 20 millisievert. This is about 8 times the average yearly dosis most people on earth receive from the cosmos and from the earth (2.4 millisievert). There are however many areas where thousands of people receive the same 20 millisievert or more on a yearly basis and do not show any ill effects. Examples are the Japanese spa Misasa (about 500 kms from Fukushima) but also areas in Brazil, India, China, France. Iran, Jordan, Greece etcetera. Stricly speaking these areas ought to be evacuated as well. The evacuation level of 20 millisievert in Fukushima represents by the way a considerable easing of the standards compared to Chernobyl: here an extra yearly dosis of 1 millisievert was reason enough for evacuation. High doses of radiation can, as we know since the atomic bombs, cause cancer [i]). Most developed countries have a standard burden of cancer of about 40%, so after the bombing of Hiroshima scientists tried to discover how much extra cases the radiation had caused. Close to Ground Zero there was indeed an excess of cancers, but at greater distance no such excess was found. This was the case in areas where the levels were below 200 millisieverts. In a graph the extra cancer mortality of Hiroshima follows a straight line that clearly shows a linear relationship between the radiation dosis and cancer. Below a level of 200 millisievert (0,2 Gy in the graph) the line is however dotted to show that for this part of the graph no data exist. It is only assumed that the dose-effect relationship keeps its linear character. There is no proof for that. This is ‘science by assumption’, which equals fantasy. The implication of this fantasy - which has dictated government policies all over the world is: radiation is always dangerous, even in the lowest dosis, only the null-dosis is safe. This is called the Linear No Threshold Hypothesis. The line does not show a ‘threshold’ which means that there is no radiation level after which radiation suddenly becomes hazardous. This is unlike most of the chemicals we know. Alcohol is not dangerous in any quantity, it only is if you do not drink at all or if you drink in excess of a certain level. A daily moderate consumption is however recommended. For fat goes the same. A graphical display of the LNT-hypothesis. It’s a straight line without a threshold. The dotted part is however based on fiction since no data for that area are available. Many scientists have found a threshold there, meaning that until that level is reached radiation is beneficial. Now, correct or not, this LNT-hypothesis is used to calculate the number of radiation victims, and in this piece we’ll use Fukushima as an example. in Fukushima. According to the ICRP, (the International Commission for Radiation Protection) the chance of cancer is 1,25*10-2 per sievert[ii]. This means that when 10.000 people each receive a radiation dosis of 1 Sv (1000 millisievert) 125 of them will later die of cancer. In Fukushima 20 millisievert was used as the lower limit for evacuation, the question is what was the amound of radiation that people would have received in a worst case? Now of course the sky is the limit here, but an upper limit of 200 millisievert seems reasonable here. In Chernobyl twice as much radioactivity was released but nevertheless the average population, whether they were evacuated, stayed or later resettled never received doses as high as 200 millisievert (of course this excludes the workers/firemen). 10.000 people each irradiated with 1 Sievert radiation produces 125 extra cancer deaths. 100.000 people irradiated with 1 Sievert radiation produces 1250 extra cancer deaths. 100.000 people people irradiated with 200 millisievert produces 250 extra cancer deaths. So 100.000 people were evacuated to prevent 250 extra cancer deaths. Is that much. Does that weigh up against the cost of the evacuation? An evacuation is no ‘free lunch’ suggested an article in the British medical journal The Lancet in march 2012[iii]. 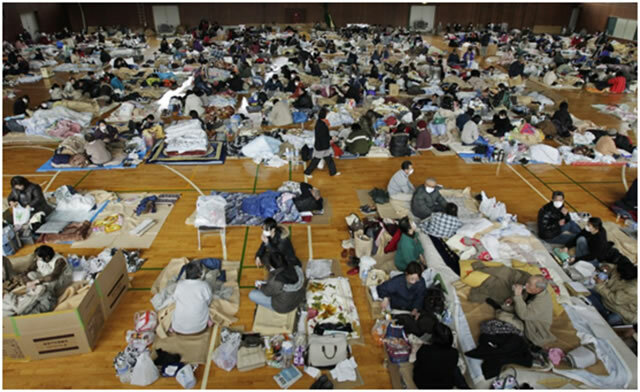 A team from Hiroshima University described what happened on the morning of march 14 2011 during the evacuation of 840 patients form hospital and nurzing homes to Minamisoma City which was 26 kilometers away. Medical personnel did not accompany the patients during transportation. Bed-ridden patients were laid down on the seats, wrapped in protective gowns. During trans­portation, some patients suffered trauma by falling from the seats of the vehicles. Evacuation continued late into the night. As the situation at the damaged plant became more volatile, the evacuation became more rushed and patients were transported by police vehicles as well. The vehicles were packed full, not only with patients but also with residents who had missed the chance to evacuate on their own. Late at night on March 14, patients were required to leave the buses because admitting hospitals or facilities could not be found and the vehicles were required elsewhere. Eventually, the patients were temporarily housed at a meeting room of the Soso Health Care office in Minamisoma city, with fl0 heaters or medical supplies. Many had to wait for more than 24 h before reaching admitting facilities. 27 patients with severe medical problems such as end-stage renal failure or stroke were transported more than 100 km to Iwaki city. At least 12 of them were confirmed dead at 0300 h on March 15, ten of whom seemed to have died in the vehicles during transportation. Later, it was reported that more than 50 patients died either during or soon after evacuation, probably owing to hypothermia, dehydration, and deterioration of underlying medical problems. In the Fukushima Daiichi Nuclear Power Plant accident, there were no deaths related to radiation or the explosion of the reactors. However, the evacuation of these patients was accompanied by loss of life. No signs of contamination were found in these patients, even after spending 48 hours in the dangerous area. 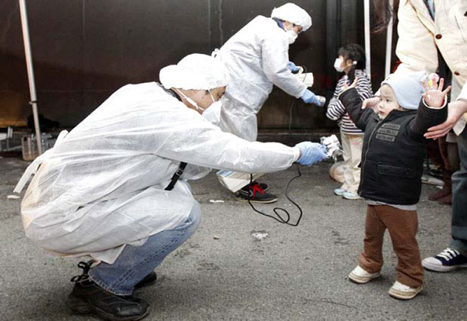 Little Japanese guy is checked with a geiger counter, but apparently thinks that he is held at gunpoint. This Lancet story is not unique, there are several similar stories but it is hard to check their overlap [iv]. Therefore only the final report of the Japanese recovery agency is mentioned [v]. This agency was assigned to check the claims for damage by the kin of ‘Disaster Related Deaths’ – fatalities that could not directly be blamed on the disaster , but rather on the emergency operation itself. The agency finally found a few thousand of these cases, but it is unclear if they are all related to the nuclear inspired evacuation or also with the relief effort for the earthquake and the tsunami. According to dr Genn Saji, before his pensioning secretary of the Japanes Commission for Reactor Safety the most reasonable estimate here is approximately 1000. From these people 90% was older then 60 and they all died in the first month after the disaster. These deaths are extra wry because they occurred for fear of a disease that would probably manifest itself twenty years later. They would then probably be dead already or have cancer anyway. Dr Richard Wilson, Mallinckrodt professor of physics at Harvard (em.) points to the fact [vi] that an evacuation is not only a stressfull event, but that stress increases ones chances of getting cancer. Something like a divorce, which he sees as comparable to an evacuation increases the chance of cancer with 15% so he thinks that he stays on the safe side if he sets the cancer increase due to an evacuation on 5%. This means 3000 cases of cancer through evacuation-stress (on 100.000 evacuees)[vii]. In the reports on Chernobyl[viii] [ix](where an extra exposure of only 1 millisievert was enough ground for evacuation) it was concluded that the psychological effects caused the major health damage. The worldwide radiophobia, constantly fed by the media, by activists by politicians and by scientists and the evacuation itself was responsible for psyhiatric problems, poverty, alcoholism, suicide and 200.000 abortions. It is very likely that Fukushima will show a similar picture. The BBC aired a documentary on a Japanese girl that was only allowed to play outside 30 minutes a week, because the radiation level on her playground was 0,3 microsievert/hour. She was told that this level - similar to worldwide background levels - ‘a bit high’[x]. So the balance is max. 250 lives saved, 4000 lives lost. Of course, several parts of this calculation can be criticized, but it still would take a lot to get to a balance that is positiev for evacuation. Other people have made similar calculations [xi]. Physicist professor Richard Garwin estimates that after several years the number of lives the evacuation saved might reach 1550, [xii], but he adds immediately that this will not alter the negative outcome of the evacuation. The number of people ultimately killed by stress may be much higher or much lower, and it is of course very likely that the people who are not evacuated are exposed to a lot of stress as well, when they read in the papers that they are living on a very dangerous spot. But then one should also keep in mind that most scientists agree that the LNT-hypothesis exaggerrates in the low dose realm, in other words: the number of 250 victims is probably much lower. Not to forget that a substantial number of scientists is convinced that these dose levels are beneficial. In their view people should not evacuate FROM Fukushima, but TO it. If the evacuation is unnecessary, then what should happen in case of an accident like this? According to Wilson an immediate evacuation makes only sense in case of acute danger. In nuclear terms: is there a threat of radiation sickness? This requires a dose ot at least 1 Sievert and that in a couple of hours or shorter period. There was no reason to fear for this in Fukushima and this was known in advance. In nuclear accidents there is danger of release of the fission products Iodine and Cesium. Their radioactive properties are known, and the first people at risk here are the employees of the nuclear power plant. If none of them receives such a dose it is highly unlikely that people at a greater distance will. Professor Richard Garwin proposes to make the evacuation optional and to financially compensate the people who decide to stay home. For the government this is a lot cheaper then the massive evacuation. Chairman Eric Loewen from the American Nuclear Society (an organisation of nuclear workers - they are the people that actually receive the bulk of the radiation that ordinary people are so affraid of - calls the evacuation an overreaction on low doses of radiation and hoped that the people would be very soon allowed to return to their homes[xiii]. Dr Genn Saji adds: ‘It is important that healthy young people and adults return in the contaminated areas and restart their healthy lives, even when the local dose rate is at 100 mSv/yr’. Radiationexpert Cuttler [xiv]: ‘How can ICRP recommendations still be based on protecting against genetic risk at this level, when human suffering and economic costs are so great? The ICRP has been progressively tightening its recommendations for occupational and public exposures, from 50 and 5 mSv/year (ICRP 1958) to 20 and 1 mSv/year (ICRP 1991). Instead of ALARA, the radiation level for evacuation should be “as high as reasonably safe,” AHARS. For nuclear accidents, the 20 mSv/y level could be raised 50 times higher to 1000 mSv/y, which is similar to the natural radiation levels in many places. And when low dose level radiation stimulation of the biological defences against cell damage and cancer is considered there is no reason to expect any increase in cancer risk. It is very difficult to understand why the ICRP recommendations have not changed accordingly. There would have been no need for this evacuation’. [iv] Inquiry sees chaos in evacuations after Japan Tsunami. Hiroko Tabuchi. New York Times july 23 2012. [v] The original report is here: http://www.reconstruction.go.jp/topics 240821_higashinihondaishinsainiokerushinsaikanrenshinikansuruhoukoku.pdf” but it is in Japanese. A summary can be found here ‘Implication of the LNT hypothesis for evacuees from the Fukushima NPP disaster’ by dr. Genn Saji in a presentation on august 30 at Kyoto University, but the figures have since been updated. [vii] Calculation: In a group of 100.000 ultimately about 40% will die of cancer. The 5% extra cancers by evacuation stress can not simply added to this 40%. Therefore one should take the group that doesnt get cancer (the remaining 60%). This then needs to be multiplied with (100-5)/100= 0.95. This is 0,6*0,95=0,57, which means that the cancer-free group is no longer 60% but 57%. The chance on cancer is then no longer 40%, but 43%. 3% of 100.000=3000. [xii] Evaluating and managing risk in the nuclear power sector. Richard L. Garwin. IBM Fellow emeritus. Presentatie op het Risk Management Symposium, march 9 2012. The Cosmos Club, Washington DC. [xiii] Presidents special session: Low level radiation & its implications for Fukushima Recovery. 2012 Annual Meeting American Nuclear Society, june 25 2012 Chicago.